This is the final edition of BPVC-III NH. The content of this publication will subsequently be incorporated into future editions of BPVC-III-5. 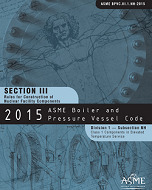 BPVC-III NH-2015 contains requirements for materials, design, fabrication, examination, testing and overpressure relief of Class 1 components, parts, and appurtenances which are expected to function even when metal temperatures exceed those covered by the rules and stress limits of Subsection NB and Tables 2A, 2B, and 4 of Section II, Part D, Subpart 1.